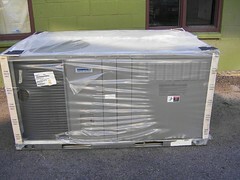 After a couple weeks of no-A/C craziness, we are finally getting a new A/C in today! Sitting next to the building, waiting to be installed. I think the guys are really excited about working on the giant beast. 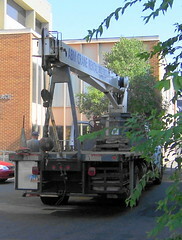 A crane has to be hired to lift the new A/C onto the top of the building. 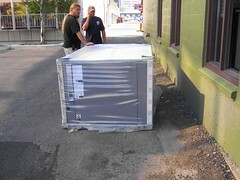 The crane just got here, and the guys are loading the new A/C unit. If I do figure out a way to take more pictures of the progress without interfering with the guys’ work I’ll do so. Otherwise I’ll just sit here in the kitchen and wait for the A/C to kick on!